Mon, November 10, 2008: Resurrected some of the older spiritual articles I wrote for SpiritWeb.org back in 1994-1997 (for now password protected): Reincarnation, Multidimensional Realities, Third Eye, Art of Descension, Spiritual Evolution, I Am The Light, Sleeping Humankind, and also Numbers. Wed, April 9, 2008: Added more personal views on spirituality & spiritual path, and illustrations. Wed, October 10, 2007: A brief overview on some spiritual topics. For now just a few thoughts . . . Note: the included illustrations are a personal perception by the respective artists, and should not taken 1:1 but rather be an inspiration for an opening of yourself. but a spiritual being having a human experience. I'm not really into quoting scriptures, because most quotes are so precious and should not be quoted without introduction, explanation and providing the context; yet, Chardin's quote is one of the best I ever read, and I recommend it to people who just started to consider a spiritual path, and also as reminder for people who have 40-50 years on their spiritual path, e.g. following a certain yoga path, or studying esoteric scriptures and so forth. It reminds us not to forget what is important, what the truth is, and that the truth can be wrapped with a piece of paper, like we use to wrap a gift before we hand it over. One thing is the wrapping, another what's in the box, what's in the core, what's the inner most truth. Of course, the same time we may see and face the truth, but we don't recognize it, because we used to see the shiny wrappings, and mistake the wrapping with the true core of things. That's why sometimes the wrappings are removed, so we can see the core - in these moments we feel a loss of the wrappings, before we realize it's about the core . . . and begin to remember, re-member - and these are most wonderful moments. 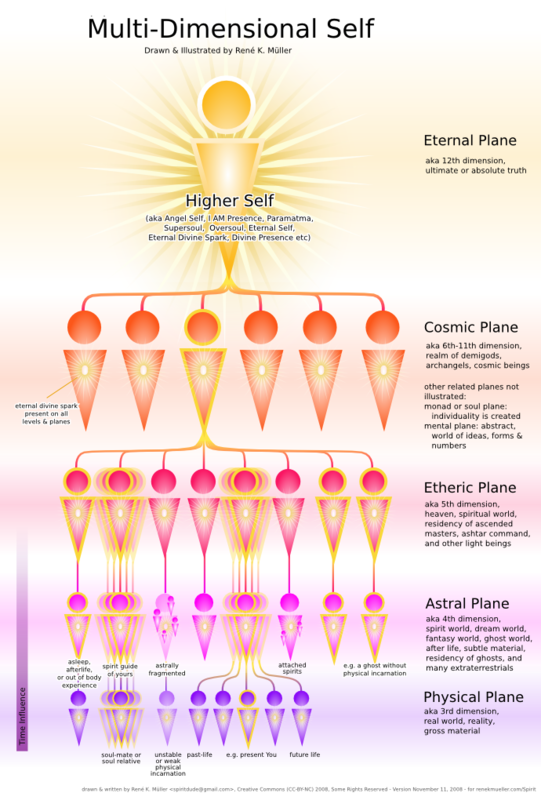 I used to be very connected with the "higher" realm, the higher the better I thought often - but I was missing the point. The point was I was here, as human being, on Earth. It took me a while, almost 30 years to descend better and progress in my birth process so to speak. 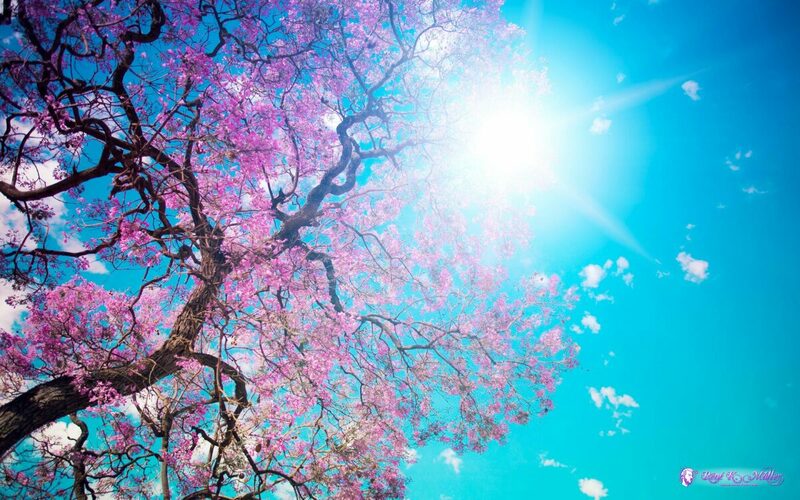 Finally, due the assistance of one of my spirit guides, realized Earth is alive, the trees, the mountains, the water, the wind, the bush, the grass, the flower - it has a voice, and it can be heared, and even talked to, and you can have a conversation. I know, you think, he speaks metaphorically, or is he "koo-koo" - well, isn't a miracle we are able to correspond with words to each other, and in most cases understand each other in words? How does it work? How can words reflect an inner reality of each other? We never question this, because it simply works as we communicate via consciousness finally solely, with the aid of words, but that's not really a requirement, the written or spoken words - we can communicate via consciousness direct. When I open myself, and allow to hear, with my "inner" ear so to speak, where the sounds finally arrive from my (physical) outer ear - in a way, bypass the outer ear, then you hear the inner worlds. There we can connect to anything and anyone; may it be a mountain range, an island, an entire continent or Earth itself, or an ant, a mouse, a dog or cat; or someone without physical body, a ghost, a spirit-guide, a being from another world and realm, an angel, an archangel or the Source of All. One of the reason why I desired to live first in a tipi and then in a yurt , after my bicycle trip in 2005 where I experienced nature most intimate - it was about to be "closer" to nature, to stay connected, to hear nature . . . to be close to a friend in a way, not to forget how precious he or she is. Of course it's a bit absurd, because we can never be truly separated - we can be separated with the consciousness and awareness, only there the illusion can be established - but we are always connected, and when we know it, and are aware of it, you are having a great friend on your side. A bit of my passion on nature you find at StillNature.org . My view on spirit, soul and God is expressed in the background of this web-site, at top of the page(s). The white color is God, the bubbles are spirits, souls - they are made of the same substance, yet, are separated with a boundary. I consider religion a schooling system, some people grow with it, some people may have outgrown it. Within each religion is a core of spirituality, usually the seed of the founder who experienced God in a communion or mystic experience; by the time and growth of a religion the core is usually neglected and the more the religion becomes a power instrument the spiritual core almost vanishes in the system, until it collapses. Circumventing a space with a boundary, creating a separateness, the thicker the boundary, the stronger the sense of identity, of self - the denser the realities can be perceived, created and thereby participated. Arriving in a certain realm, and using a vehicle/body to participate there. The lighter, more translucent, and disintegrating the boundary becomes, the more united the individual becomes until it re-merges - re-members the light it is of and came from, also known as enlightenment. Leaving a certain realm and its former vehicle/body. Body is the container and set of boundaries to operate in a certain realm, e.g. physical plane. Ego is the sense of identity, derived from the boundaries. Brain & Mind is the computer to compare things, sort and judge - great servant, really bad master. Soul/Spirit true identity, often covered up by the above mentioned. One is not in a particular realm present, but otherwise still connected via a thread in order to return. Arriving and being present in a certain realm, alike birth. The boundary which is developed separated the spirit from the Great Spirit, it is of multifold densities, like layers of an onion. Each layer adds glasses to look at an aspect of all, multiple layers fragments the identity into multiple Selves, from which the term Multi-Dimensional Self is derived from. From a top-down perspective there is no multi-dimensionality, it is just layers and focus on their refraction of the whole - yet, for sake of explaining one isn't just physical it's a great term to make one aware there are more than just one layer of boundary, e.g. physical. That part of you who never left and never separated and is still one with All That Is. 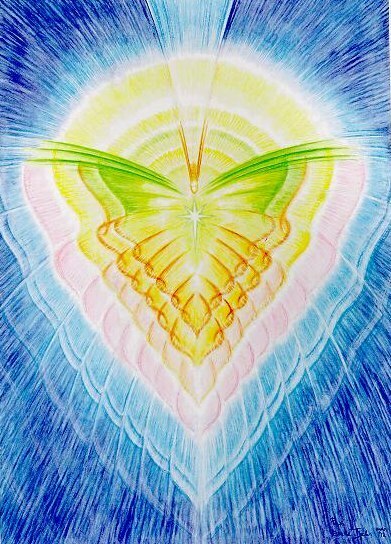 The Higher Self is also known as Paramatma , I AM or I AM Presence, Angel Self, Divine Self, Eternal Self, Eternel Soul, Eternal Spirit, Supersoul, Oversoul. This is a term rarely used, in opposite of "Higher Self" - the incarnated self, the presence you perceive as yourself, but as mentioned, it's mostly made of the identification with the body and mind, and the forming of ego, who is the source of fear e.g. for survival, wants to stay in the body and live here. astrally fragmented, e.g. due shock and going out of body during strong event (e.g. abuse and violent occurances) - also known as soul fragmentations, healing through "soul retrieval & integration"
Note: some cosmologies name more subtle planes higher than physical but still below astral as "etheric" - here, as I use the term, etheric resides higher than astral - it is just terminology which is different. Are there 3 dimensions, width, height and depth? And time? 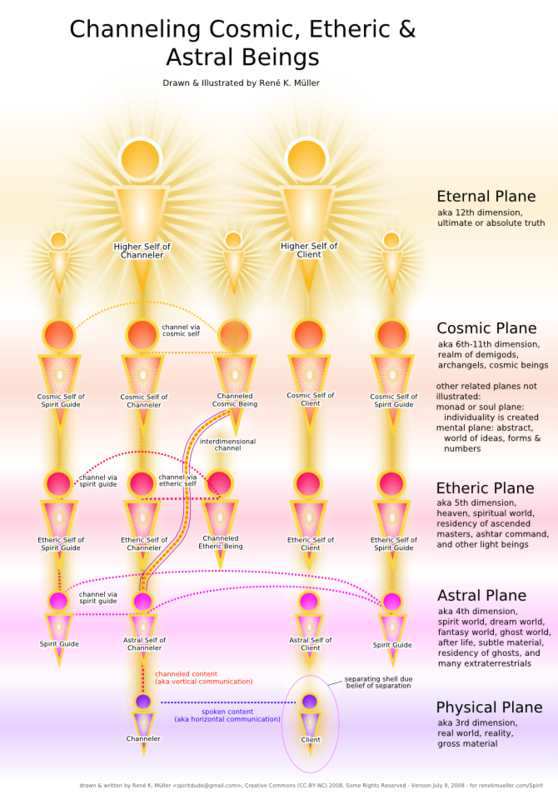 What is astral, what is etheric or 12th dimension? There are countless spiritual cosmologies floating around, it doesn't matter how things are labeled, important is how the dimensions are qualified. In other words, with the description of the dimensions you can map it in a general overview. 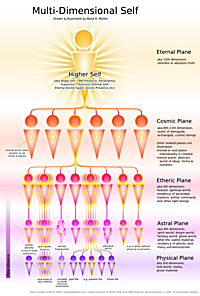 There are descriptions of astral realms which are extremely bright almost heavenly, and people already call it "5th dimension" or something else, or in their sacred books describes it as heaven, yet, it is often higher regions of astral plane, where beings are taken once they pass away from physical plane. Higher region above astral are rarely described accurately as I have experienced, often it becomes philosophical, and you enter the realm where identity and sense of self is almost vanished. It is secondary how many dimensions really exist, I estimate infinite - question is only whether you become aware that you are participating or being aware of one, this here, and aside maybe another one or even more, and become aware of the veil separating them, the entries and exists also known as (aka) gateways and portals. People who first hear about being a spirit or a soul question how the amount of humans correlate with souls, whether there are more souls "born" or? I think the anwer is rather simple, looking at a tree and counting the amount of leaves or fruits - how many are there, finite ones, but how many exactly? And next year? A tree with more sunshine has more? How many? It isn't important how many leaves, or souls - but the dynamic of life itself - there is no counter for souls, as there is no counter for leaves on a tree, the tree creates as many leaves it can grow. Souls come in clusters, in soul families - like a grape cluster - there is an inner structure of soul families. The tree here doesn't just suit as metaphor, the tree itself shows his inherent cosmic universiality as well. 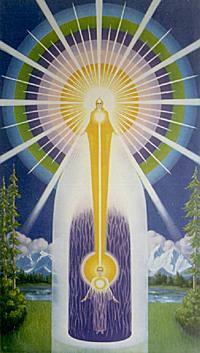 Re-incarnation is a way to view that a being is multi-dimensional through time as well. Past-lives in a way aren't past, so aren't future lives, because there is only one moment where all things happen: "Now" - but it's kind of useless to say or write it - because it's a state of mind to participate within time, without mind but with the soul you are in the "Now" entirely. Each life is a perspective and experience to study - the ability to feel someone else, e.g. with empathy and compassion, let's one learn faster. The inability to have empathy or compassion leads to experience, speak reincarnate, what it's not understood or realized which is expressed by judgement and prejudice as example. The term "karma" (which is sanskrit and just means "action") only suits as long you are unable to let go, and have no empathy or compassion. Spiritual teachings explaining the importance for compassion and forgiveness are essentially teaching how to complete a cycle, such as the the human experience on this planet. In the moment you studied a role, a pattern or a theme thoroughly through multiple lifetimes, you will sense that you know it now, reach a completion - that is also the moment when the incarnate self becomes aware of "past-lives", maybe even "future-lives" as a desire to be and live then - but as said, in those moments one simply connects other seeds of yourself through time, which also are in the now as you are. 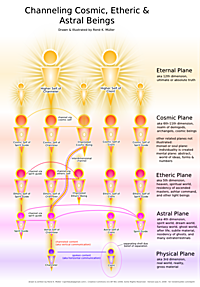 As mentioned about souls, while you getting close to wrap it up and close the cycle, you will connect with the souls in your soul family or cluster, their experiences and knowledge will penetrate your consciousness as your own, like of a "past-life" and vice-versa. The fragmented souls share their individual gained experiences and knowledge and become . . . one again. With it, many of the questions about the meaning of life, meaning and purpose of love will be answered, not by long winding words and explanations, but by the insights which forms as the result of the exchange within the soul family and cluster, as each soul aspect contains part of the answer but only in its entirety the answer is sufficient to fulfill the questions - it is . . also one of the pulling factors of the souls to come together, after they were so eager to split apart and experience the manifoldness. There is a lot of mockery happening around those terms - but I think it's great these terms have become so common, and countless seminars and web-sites shed more or less light on those terms. Channeling is a natural ability of every spiritual being, by their own nature - to treat it as something "special" may be understandable, but I think every "channeler" main task isn't just to deliver message from other realms, but to awake (!!) the ability in every person participating or listening to channelings. Often Archangels or ETs are claimed to be channeled, and it most cases they aren't the archangels neither the ETs but spirit guides and entities very close to the channeler - yet, in order to penetrate the consciousness of the channeler names and titles are assumed. A title or name doesn't give any authority or credential, but the content. Often "simple" channelings from a spirit guide can be far more enlightening and elaborate than a "high archangel" claimed channeling floating around - use your own discernment to sort it out, it's part of learning. Every being here, on the physical plane, has spirit-guides, multiple beings who are with you like best friends - these are beings helping you, as you maybe helped them - there is a deep love and trust involved helping each other, like best friends you already may have, some friendship stretch over the lifetime as a human being. And if you are scared of spirits or ghosts, remember alike attracts alike . . . so no reason to be scared. Spirit Retrieval/Integration: We are incredible powerful beings, and we are learning this, also with circumstances such as soul or spirit fragmentation. As mentioned before, fragmentation happens on various planes, and therefore different reasons - the one concerning a spirit or soul retrieval involves where it limits the incarnate self or prevents the being to proceed further. So, let's focus on common reasons when a spirit fragments: evasion or pulling away from the physical level, either psychological or actually physically - the spirit evades or is pulled and goes out of the body, and fragments in that very moment, and the fragment maintains exact that state of beingness and will or cannot age and mature, once detached from the physical body - that is also the reasons fragments cannot change and are "stuck" in their traumata. E.g. pulling out of the body is when you hold-on on something which passes, a loved one, a partner passing away, something you desire but cannot get; or evasion when you are scared, threatened or actually harm done on the physical plane and body, and you evade the pain and fragment thereby. The solution discussed briefly here involves to go back to the event which caused the fragmentation and review it from distance and accept it - as simple as this. The acceptance comes from asking the Higher Self of the client why the event occured and what the lesson was to learn - once the client realized what the purpose was, the reason, the alignment and openess happens where the fragment rejoins the astral self, and the wound get healed - sometimes right away, in some cases the astral wound takes a bit time to heal when the events have been very traumatic - consider it a kind of recovery time. Question may arise, how do I recognize I have fragments? 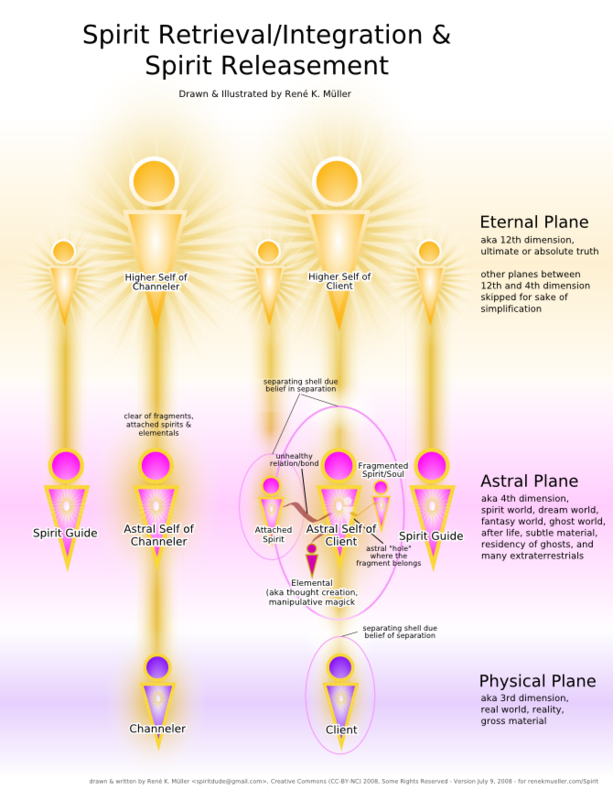 A disturbance, a wound, a hole in the astral does direct influence the physical appearance and presence - all diseases originate at least at astral or higher planes, but mostly and predominantly in the astral. Additionally ask yourself what you do impulsive and repeatably - in particular addictive behaviour is a strong sign of the fragmented self to satisify his/her needs but unable to do so. Be aware fragments may even belong to another time frame than your current incarnation, on the astral plane time isn't that rigid issue anymore than here on physical - there can be weeks, months and years or even more, but for the fragment just a moment passed, that moment when it fragmented - in a way fragments exist truly in their own moment of now and thereby timeless. Spirit Releasement: Alike spirit or soul fragments, spirits attach themselves to a person, the signs are alike spirit fragmentation just that you somehow feel this is not your thing, your true impulse but someone else's once you are made aware what you are doing. But be aware, that the spirit attached the first place there is a sympathy and likeness involved, e.g. 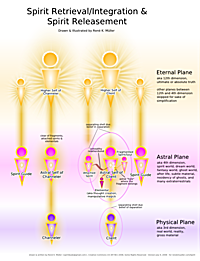 a spirit/soul fragmentation where the spirit attaches at the very "astral hole" which occured when you fragmented - and here it becomes clear why these two topics occured often simultaneously. Ideally, a channeler or spiritual healer is clear in the sense free of fragments, attached spirits and elementals - but I have seen myself only one person the last 15 years where I didn't spot any of that and was indeed clear in that sense. What I'm saying, it's rare people are clear astrally - the reason they are incarnate here is in order to proceed and learn, adjust and heal astral reality. Note: fasting does soften your ties on the physical and makes you more receptive for the astral and higher planes; the clearing effect on the physical body is actually a clearing also of the astral patterns which finally show in the physical. Needless to say, "healing" someone is an act of great responsibility and the final aim of each healer is to empower the client to become a healer him/herself as well - in a way we remember each other who we truly are, spiritual beings on a journey, and currently in a human form. In 1994 I started SpiritWeb.org which became by 2001 the largest spiritual web-site on the net with over 3,000 articles on healing, meditation, yoga paths, hundreds of channelings, and much more, where some of them true pearls of wisdom who you might have not found in print or somewhere else, and a few dozen religious and spiritual books (Old & New Testament, Apocryphes, Quran, Bhagavad-Gita as well Plato and Plotinus), among with webchat, bulletin board (threaded discussion), and mailing-lists I programmed. I got to know a lot of people, a few close friends even. The site grew from a couple of hundreds to finally over 100,000 registered members, and 30,000 unique visitors per day. Unfortunatly with the growth in quantity the quality declined, the site consumed more and more administrative time, rules and enforcing rules became my main task - one day I realized it wasn't worth my time to continue, and it was time to move on, and I closed the site in 2003. I learned a lot with running the site, about people, group dynamics, myself, channeling, and lightwork - things I was and I am still interested in. Spirit Diary, my little diary or "blog"
Lightworkers.org , community site, broad focused therefore lot of "noise"